The McDade Trail is a biking and walking trail designed for people of all abilities. 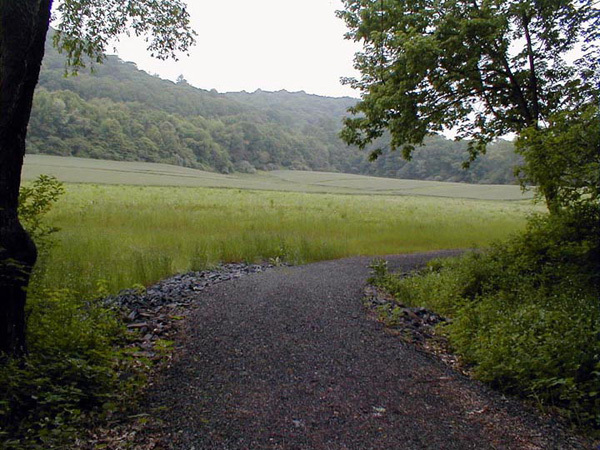 This wide gravel path follows the Delaware River for 5+ miles and is the perfect place to enjoy the scenic beauty of the Delaware Water Gap National Park. Along the trail are areas designated for picnicking and swimming which have restrooms and vending machines. The Trail winds along the river, mostly in sight of it, but also on the top of the river banks through corn fields and meadows. This is where the first settlers lived and occasionally you will see traces of earlier inhabitants. Rows of ancient Pines that obviously were planted by someone over 100 years ago, traces of old stone foundations, traces of river fords, and maybe an arrowhead laying alongside the trail (don't touch) these are the property of the US government! > Overnight accommodations at a Poconos Inn in a room with private bath and a continental breakfast. All for two. > Map to Trail Entrance, Map of Trail, Guide to The Delaware Water Gap National Park. This package is for the novice to intermediate bikers. A fun easy trip with some hills and single track up and down the same path with views of the river and mountains. Since you will be traveling through the National Park the entire trip, you'll not see any houses and very little evidence of civilization. The land along the trip is pretty much the way it was in the 1700s. In addition ot the McDade Trail which is along the river there are some county road side trips for more experienced bikers that cut off of the trail to either extend your trip or to make it more challenging. For bike rentals go to Edge of the Woods Outfitters just 5 minutes from where the trail begins. Bikes can also be picked up at the Smithfield beach river access area about 1/3 af the way along the McDade Trail. Or at the store at 110 Main St. Delaware Water Gap, PA. 570-421-6681 Guided hikes in the area are also available. You may request a specific inn during the reservation process and most of the time we will be able to accommodate you. However final selection of the inn is based upon availability. It is possible that we may have to finalize your reservation at an inn other than your preference. Each inn has its unique ambienace and all are inviting, clean and friendly. Location: North of I-80, along the PA side of Delaware River. 70 miles east of New York City. 90 miles north of Philadelphia, Pennsylvania in Monroe County. Length/Configuration: 5 miles between Hialeah and Turn Farm. Out and back ride with additional miles on nearby dirt roads. A second 2.7 mile section from Milford Beach to Pittman Orchard is near completion. Terrain/Surface: Gravel path. Additional riding on unpaved roads. Elevation Change: First 3 miles: Minimal, relatively flat. Last 2 miles: rolling hills with several long climbs and a few steep ascents and descents. 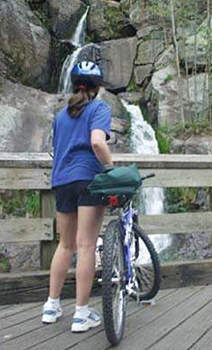 Trail Use: Hiking, mountain biking, bicycling, cross-country skiing. No motorized vehicles. Caution: Shared-use trails. Beware of Poison Ivy. This is a scenic 5 mile (one way) section of the lower McDade Trail, located 70 miles from New York City and 90 from Philadelphia and is perfect for a day trip or weekend escape. Your ride follows the Delaware River for most of it's length, offering lots of river and forested mountain ridge views. The ride travels for the most part over a gravel and cinder surface through stretches of woods and along the edges of corn fields and overgrown fields. Except for a short section, where you cross the paved Smithfield Beach parking lot at the trail's midpoint, the path is always shaded by the half canopy of trees lining the river side of the trail. The trail is relatively flat, except for the 1.5 miles rolling hills between Smithfield Beach and the Hialeah Picnic Area. At the end of the five mile ride (midway on your complete 10 miles oth directions) is the Turn Farm Trailhead. This is a quiet spot on the site of a farm from 1815 by John Turn, a carpenter and cabinetmaker. Shaded by a giant weeping spruce tree, there is a table overlooking the Smoke House, the only remaining structure (besides the lime kiln across the road) left on the farm. During your ride you will cross Smithfield Beach which offers a roped off river swimming area with lifeguards, restrooms and changing rooms. There is a grassy, picnic area of shade and sunny spots were families, kayakers and rafters enjoy relaxing. Between Smithfield Beach and the Hialeah Picnic Area is a challenging hilly ride with some steep hills you may have to walk your bike up. The trail surface is looser, rougher gravel and gos through a mix of woods and fields. There are several long climbs and one challenging, steep (35 degree) climb that you may have to hike a bike up. And . . . you get to do it again on the return trip! If you want to extend your bike ride a little further, just north of the Turn Farm Trailhead, The Freeman Tract Road (bear sharply right just past Turn Farm trailhead on River Rd. 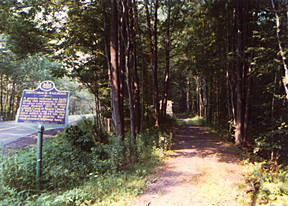 ), is the original roadbed of River Road which leads down to the old ferry landing at Walpack Bend on the Delaware River. The road is owned by the township, is unpaved and provides several additional miles for walking and biking on a lightly-trafficked road. Access to the Freman Tract road requires travelling a short way north on paved River Road. Use extreme caution as there is no shoulder and Canoe and Kayak Outfitter' vehicles as well as tourists pass up and down the road constantly. You may also want to try unpaved Zion Church Road, accessed from River Road around the midpoint of the trail. The path leads to the Hidden Lake Picnic Area. Several old dirt roadways and footpaths circle this quiet lake. One of the highest elevation rides in the Poconos. Absolutely wonderful views of the Delaware Water Gap, and across NJ to the southern tip of New York State. (Look for the obelisk at High Point Park to the North East.) Get information, maps and supplies at "The Loft" on Camelback Road on your way up. Make it a two day trip and spend the second day relaxing your sore muscles at Camelbeach Water Park in the Kahuna Lagoon Wave Pool. The trails are numerous, some isolated, single track and woods roads and an old railroad bed. Take lots of water on this ride! Be aware of the wild life - we've seen bear, foxes, an abundance of dear and on one occasion a real wild Bobcat. State Game Lands 38 contains 3,943 acres of forest adjacent to Big Pocono State Park and is undeveloped, with rocky, little-used roads and an abandoned railroad grade. A boulder field and kettle lakes are reminders of glacial history. The glacier gouged out depressions, which filled with melting ice. These lakes are fed by groundwater alone and, on a geologic scale, are temporary features. They will eventually fill with sediment and become swamp and then forest. Interesting features: Pennsylvania kettle lakes, boulder field. Surface: Rough woods road, abandoned railroad grade, power-line cut. > Overnight accommodations at The Chateau (a 3.5 to 4 Star hotel on the Mountain) for two. Breakfast is available for a charge in the onsite restaurant. > Map to Trail Entrance, Map of Trail, Guide to Big Pocono State Park. This package is for the novice to intermediate biker. A fun easy trip with some hills and single track up and down the same path with views of the river and mountains. Since you will be traveling through the State Park the entire trip, you'll not see any houses and very little evidence of civilization. The land along the trip is pretty much the way it was in the 1700s. For bike rentals go to The Loft just 5 minutes from where the trail begins. Camelback Road Tannersville, PA 18372 Guided hikes in the area are also available. You will stay at this Hotel "The Chateau Resort"
You may request an other more romantic Country Inn during the reservation process and most of the time we will be able to accommodate you. However final selection of the inn is based upon availability. It is possible that we may have to finalize your reservation at an inn other than your preference. Each inn has its unique ambienace and all are inviting, clean and friendly. Biking: Bicycles are permitted on all hard surface roads shared by vehicles. Mountain biking is permitted on South Trail and North Trail Lower Loop. Bikes are prohibited on the connecting trails from the parking lots and on Indian and North trails. The top of Camelback Mountain is a unique forest called a scrub oak shrubland. Wind-dwarfed gray birch, quaking aspen, red pine and scrub oak cover the mountaintop, with no tree over twenty feet tall. Lowbush blueberry, sweet fern and mountain laurel grow under the short trees. Down slope, the forest offers more shade with mixed hardwoods including oak, maple, and hickory trees. Portions of South Trail are lined with blueberry and mountain laurel, which bloom in mid-June. On the north side of the mountain, North Trail Lower Loop Trail on the old railroad grade passes through a rock cut and offers hikers a glimpse of a hemlock and rhododendron glen, which is surprisingly cool on hot summer days. Rhododendron blooms in late July. Big Pocono State Park is on land which was owned by Henry S. Cattell near the turn of the 20th century. Mr. Cattell, being very fond of the view from the summit of Camelback Mountain, and knowing that many others shared his love for the area, constructed a stone cabin on the summit in 1908. The Cattell Cabin was left unlocked for many years to be used as a shelter by anyone who wished. Since 1921, the Pennsylvania Bureau of Forestry has maintained Big Pocono Fire Tower on the mountain for the purpose of detecting forest fires in the surrounding private and state forest lands. The tower is staffed only during the spring and fall seasons and has been dedicated by the National Fire Tower Association as a historical structure. In 1928, 12 years after Mr. Cattell's death, the Pennsylvania Game Commission purchased the area. In 1950, a portion of the state land on the steep north slope of the mountain was leased to Big Pocono Skiing, Inc., for commercial ski development. Later named Camelback Ski Corporation, the facility has been developed into a major ski resort. In 1953, a 1,306-acre portion of the state game lands, including the ski area lease, was acquired by the Pennsylvania Department of Forests and Waters (now the Department of Conservation and Natural Resources) for the purpose of developing a state park at the mountain's summit. Jim Thorpe is rated as one of the top 3 mountain biking destinations in the United States by Cycling magazine. Mountain Bike day trips are filled with freewheeling fun! A 25-mile self guided Bike tour of the magnificent mountain scenery through Lehigh Gorge State Park, overlooking the Lehigh River. Ride and watch your brethern paddle the river. They'll be envying you are you're envying them! No matter what type of Mountain Biking you like, the experts at Blue Mountain Sports can make your experience memorable. With some of the East's best mountain biking, the PA area boasts dozens of Colorado style trails. Home of Lehigh Gorge State Park, Mauch Chunk Lake Park and the Delaware & Lehigh Canal Heritage Corridor, you'll find this historic mountain along the Lehigh River a mecca for mountain bikers of all ages and abilities. There's a GREAT 26 Mile downhill trail on an old railroad bed......... FUN fun FUN! Glen Park - Stroudsburg, PA 18360 Collins Street off Broad - This is the local's favorite "warm up" trail. A lot of up and down through woods and glens, with some great single track across a thin ridge. View of the Delaware Water Gap, views looking north over the Poconos, and some great woods riding. The single track return across "Cliff Trail" is one of those rides that will stick in your memory, as is the attempt to conquer "Washing Machine Hill". Be sure if you are going here for the day to take a side ride into the town of Delaware Water Gap. Visit "Doughboy's for lunch, maybe even take a few minutes off to hit some golf balls on the Driving range at The DWG Country Club.